Industrial cooled boxes for placing of noninsulated tanks and storage of filled kegs and bottles. The MCB-45 cooled box with internal volume 4.5 m3 is made from PUR insulation panel with a thickness of 60 mm. The panels are galvanized both sides. It meets all requirements for hygienic storage of food and other products. This building is designed as a self-supporting structure. All internal edges and corners are complemented by hygienic plastic strips. All refrigerated boxes are supplied in a version with a floor insulation with anti-slip floor plate. 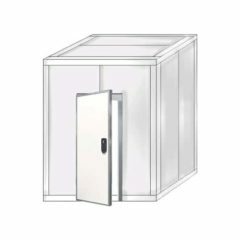 The enter into this box is handled by separate revolving door 800×1900 mm. These doors are equipped with a safety lock that prevents locking people inside. The lock has an internal illumination without power supply for easy unlock when is closed person inside at night. The MCB-62 cooled box with internal volume 6.2 m3 is made from PUR insulation panel with a thickness of 60 mm. The panels are galvanized both sides. It meets all requirements for hygienic storage of food and other products. The MCB-77 cooled box with internal volume 7.7 m3 is made from PUR insulation panel with a thickness of 60 mm. The panels are galvanized both sides. It meets all requirements for hygienic storage of food and other products. The MCB-85 cooled box with internal volume 8.5 m3 is made from PUR insulation panel with a thickness of 60 mm. The panels are galvanized both sides. It meets all requirements for hygienic storage of food and other products. The MCB-102 cooled box with internal volume 10.2 m3 is made from PUR insulation panel with a thickness of 60 mm. The panels are galvanized both sides. It meets all requirements for hygienic storage of food and other products. The MCB-129 cooled box with internal volume 12.9 m3 is made from PUR insulation panel with a thickness of 60 mm. The panels are galvanized both sides. It meets all requirements for hygienic storage of food and other products.